It was time to ask for money. A little over a year ago, the company I work for launched, for lack of better terminology, an innovation incubator. Once their MVP was in hand, a team could Shark Tank the idea in front of leadership. If approved, the project would be funded, official project code and all. Up to this point, I was putting the “Minimum” in “Minimum Viable Product Project Plans.” The entirety of my project planning consisted of several pages of chicken scratch notes and a few hastily thrown together slides. So, first up was putting together a respectable project estimate and presentation. I worked with the team to develop the estimates, including project management, architecture, UI development, and algorithm development and tuning. The majority of the project’s budget is people time, so I tried to err on the side of generous. Most of the team were new to Machine Learning, so a larger learning curve needed to be taken into consideration. What is the ROI of the project? Since we work in consulting, and our people’s time is billable, the math is pretty simple… Take the potential revenue from a staffing match made by our algorithms and divide by the cost of the project. Will this work? Well, we think so. The MVP was promising. But at the end of the day, Machine Learning requires some hoping and praying and patience. Just like humans, it gets smarter over time, and you do not want to set your expectations too high at onset. How can we extend the Machine Learning knowledge we gain to other parts of the company? Of course, this project would be a great showcase of our abilities to clients. But there are also a ton of other places to extend our newly acquired skills internally. Have I mentioned my dream of conducting candidate interviews in virtual reality? What are the risks? We build something no one cares about and never uses… That we scope creep this over a cliff… That we build the AI so awesome that the computers rise up and overthrow all the humans at our company. New faces quickly becoming old friends: We lost 2/3 of our machine learning team in April which meant a mad scramble to replace them with new faces. With copious sweet talking, I was able to convince (con?) two more data geeks to join on. Like most everyone on the team, they are fairly new to Machine Learning and will be using this as a learning opportunity. Seeing people in real life: The entire team got together in person two weeks ago to flesh out the architecture. Up to this point, we had all been working remotely, so this was our first time to actually sit in a room together. While I generally think remote work is highly efficient, there are times that face to face interaction is invaluable. This was certainly one of them. So much so, I think I will dedicate a future blog post just to our architecture sit-down. What’s making me feel dumb – Just as I am starting to feel comfortable with all the Machine Learning terminology, I got all the data architecture stuff thrown at me during our on-site day. My head was spinning with talk of Data Factories and Data Lakes, Data This and Data That. I took mad notes during the session, highlighting the words that were gibberish to me. Sometimes I feel like I have landed in a foreign country where everyone is fluent in the local language except me, and I am just wondering around repeating the one phrase I know. Où est la bibliothèque? What’s making me feel smarter – I finished the Data Science Orientation class towards my Microsoft Data Science Professional Certification and moved onto the T-SQL class. Back in olden times, I managed an Oracle database team and subsequently became pretty proficient in PL/SQL. However, I had not written a lick of SQL in at least a decade. So I was pleasantly surprised that all the OUTER JOINs and INNER JOINs came back pretty easily. I guess it is true that you retain skills more or less forever. What’s keeping me up at night – Scope creep, the bane of every project manager’s existence. We made some design changes since the funding round, that will undoubtedly add to our development and implementation time. I am comfortable that these changes were the right things to do, but they are eating into the budget. I am going to have to be a time hawk over the next few weeks and may need to make a decision whether we ask for more budget. 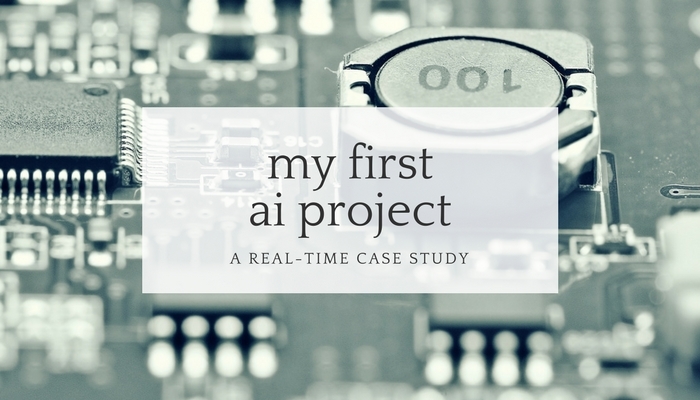 This is the fourth installment of my real-time case study on my first AI project. I plan to share what we are working on, what is going well, what is sucking at the moment – everything – as it happens.